Marylou Tyler illustrates the SDR’s role in filling the sales funnel. It’s worthwhile to take regular stock of a startup’s progress in the context of its original plans. This exercise enforces discipline in the planning process: highlighting past mistakes caused by off-base assumptions or ill-conceived strategy makes similar errors less likely in the future. Not to mention that it’s also kind of fun to compare the original plans to the reality. In the case of Gain Compliance, how does the current reality compare to the best-laid plans of eighteen months ago as we were just getting started? Take one slice of operations: an area of particular interest at the moment is sales structure. 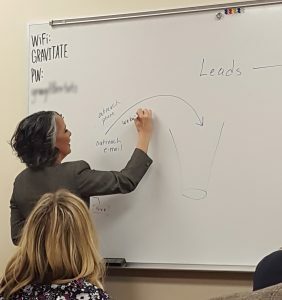 A few of us recently attended Marylou Tyler’s Predictable Prospecting seminar. This provided a gut check: Gain’s original sales and staffing plans, as well as its early marketing activities, were based upon the structure Marylou champions. For both our company and marketing roadmap, we have leveraged the framework offered by Marylou Tyler (author of Predictable Revenue and Predictable Prospecting). These two books provide invaluable insight into the best practices for a successful sales organization. For example, I’ve modeled our hiring plan, roles, sales ramp, and quota structure on the partnership between Sales Development Representatives (SDR’s, fulfilling a prospecting function) and Regional Sales Directors (RSD’s, a more conventional sales role). At this point — as we’re still pre-product — this is largely academic from an execution standpoint; however, it still serves as a meaningful exercise to understand our funding needs as well as our expense and growth drivers after product launch. So, that was the plan. What is the reality? First, the disclaimer: it’s still relatively early, and the ultimate outcome might be substantially different. But, while we haven’t ramped sales efforts, we do have some early data as to whether we were on the right track. Now, the answer: indeed, we are executing on a sales plan that looks remarkably similar to our original intent. The reason we’ve stuck with the framework has less to do with committing to a path and following it, but more about its underlying logic and the value it brings. We explored alternatives, but always came back to the differentiated roles of the Predictable Framework. As Gain made its first, management-led, pilot sales efforts, I instinctively tried to consolidate responsibilities. After all, a single person who can both prospect and close deals would be more economical, right? At the end of the day, though, it became apparent that the best results for prospecting will come from a person with a set of skills that is unique and different from those associated with closing deals. Both roles are different, and the one-person-who-can-do-it-all approach does not maximize outcomes.